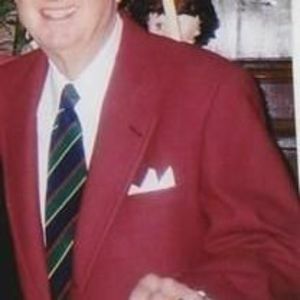 Albert G. Simpson, Jr., born in New York, New York to Albert G. and Elizabeth Adams Simpson, passed away of natural causes at his home. His family moved to San Francisco in 1927 and to Hillsborough the following year. He attended Burlingame High School from 1942 -1943. With the advent of World War II, his father was called to duty as Executive Officer of the Santa Ana Army Base. Albert graduated from Newport Harbor High School and served in the Army Air Force from 1944 - 1946. After separating from the military at Hickham Field in Oahu, Hawaii, he attended the University of Hawaii for one year and graduated from Menlo College in Menlo, California in 1948 with an AA Degree. Albert was a salesman and buyer for Dohrmann Hotel Supply for eleven years and Zellerbach Paper Company for two years, both in San Francisco. He ended his career as Vice-president of Puro Filter Company in Los Angeles after eighteen years. Albert married Shirley Hixon on November 20, 1950 and they had two daughters, Elizabeth S. Simpson (deceased) and Pennell S. Rochowansky. Following a divorce, Albert married "the love of his life" Elinor J. Simpson on September 17, 1963. They enjoyed traveling the world for forty-eight years until she died on December 8, 2011. He is survived by his daughter, Pennell, of Encinitas and his grandson, Kristopher M. Bolstad of New Braunfels, Texas. There will be no celebration or ceremony. Albert will be interred at Mt. Tamalpais Cemetery in San Rafael, California. The family suggests that any memorial contributions be made to Hospice of the Central Coast, 2 Upper Ragsdale, Ste. D-120, Monterey, California, 93940. Please visit www.thepaulmortuary.com to sign Albert's guest book and leave messages for his family.